Things have gone a little better this week. I'm slowly getting on top of things again and taking things one step at a time. My new workout has been tough but immensely more rewarding already, and I certainly don't dread doing it (yet). But I am only three days in! Even so, focusing on strength and knowing - and feeling - that I'm making progress with every increasingly difficult rep makes me feel so much happier and more sure of my body's abilities. And the added burn is just as well with Easter around the corner! These are the things I'm obsessing over this week - the Easter 'egg' I've had my eye on, limited edition for April Fool's Day, it's peanut butter and banana. 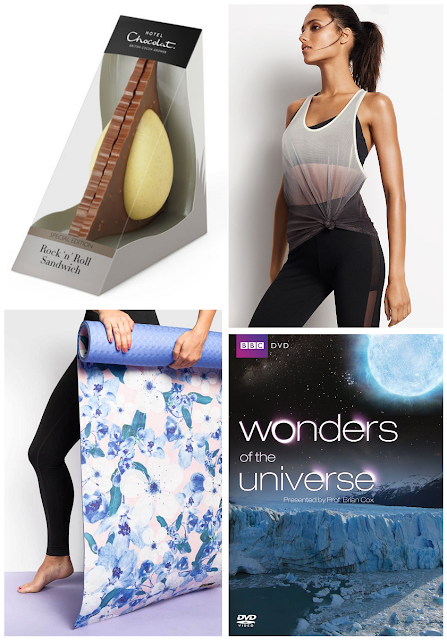 Victoria's Secret's new line of ombre tanks, yes please, and Cassey Ho's new line and, most of all, the new suede yoga mat in the Dusky Blossom design.